From the top of the frozen mountain it stood, watchful, sentinel. Long claws rasping the iced cold earth. As the clock ticked, it remained aware, watching the one named Matt, the one named Freddie and the one named Van, as they brought their own melodies into sync. Looking forward, never backward, it cawked: ‘Nevermore’. And as soon as those words came out, the wind blew, and out went the Raven. From the Ashes Of Ares, a phoenix was born. And what a rebirth this is. Ashes Of Ares have risen as remnants from Iced Earth and Nevermore. The band comprises of Matt Barlow (vocals, ex-Iced Earth), Freddie Vidales (guitar, ex-bassist for Iced Earth) and Van Williams (drums, ex-Nevermore). Their self-titled debut album is a commendable effort, as well as a step in the right direction. The trio made sure to take the best from their previous bands, and mashed it all up to create the perfect storm: One of the best debut albums released in a while. 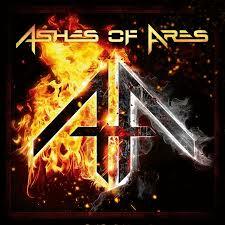 ‘Ashes Of Ares’ is a stunning album filled with standalone tracks. It starts with ‘The Messenger’, a track introed by a hypnotizing play on chords, and as Matt Barlow begins showing us his thunderous voice has not suffered any sort of loss since we last heard him, our awe-stricken musical jaw drops and listens, swooning. ‘The Messenger’ provides a great first impression, as it lets our ears wanting to follow through with the album. And so we do. ‘Move The Chains’ and ‘On Warrior’s Wings’ come next, following up with the premise established by the fantastic first song. While ‘Move The Chains’ is a more fast-paced track, with Van Williams’ drumming denoting a perfect coordination with Freddie Vidales’ guitar, ‘On Warrior’s Wings’ introduces us the first ballad-type song of the album. We all already knew these three musicians know how to make ballads, so this enjoyment to our tympanic membranes really comes as no surprise. It is a powerful slower track, with a great build-up, everything in its right place. Matt Barlow’s voice oozes feeling, reminding us he is one of the best vocalists in his genre. ‘Punishment’ and ‘This Is My Hell’ carry on with the formula. ‘Punishment’s bassline is absolutely phenomenal, and will hopefully be well-executed live by Dean Sternberg. Judging from Sternberg’s previous works, he will be a nice addition to the power trio (as well as Gio Geraca – Malevolent Creation – who will be the supporting guitarist on AOA’s live gigs). Here’s to hoping we’ll be hearing more from Sternberg from now on. ‘This Is My Hell’ was the track chosen to be Ashes Of Ares’ first videoclip, with a ‘Behind The Scenes’ video released through Nuclear Blast Records’ youtube account on August 30th (pictured below). While not my first choice, it is still a fantastic track, and hopefully will get enough air-play so the biggest amount of people will buy ‘Ashes Of Ares’. It is a song which represents the band, as it has everything they stand for in this album: Van’s skilled drumming, Freddie’s surprising guitar skills (and not so surprising bass skills – we already knew he’s very good) and Barlow’s powerful voice. On we carry to the first song to be known off this excellent album (through a lyric video): ‘Dead Man’s Plight’. It actually marks the beginning of the sequence that is, in my opinion, ‘Ashes Of Ares’ primetime, so to speak: this song, followed by ‘Chalice Of Man’, followed by ‘The Answer’. But we’ll get to that. ‘Dead Man’s Plight’ deserves a commendation on its own. Such a well-chosen intro – The catchy, ear-filling chorus as the three men sing in unison, not to mention the showing-off of their skills which happens throughout the entire track. ‘Dead Man’s Plight’ is definitely one of AOA’s strong-suits, and the repeat button just cries out loud to be pressed. Recent interviews had Matt Barlow describing Ashes Of Ares’ writing process as a collaborative effort, and it really shows. There’s such a good synchronization in every aspect of the album that is just yearning not to be ignored. It is consistent, a real lesson to new bands given by these three veterans. And there comes the biggest lesson: ‘Chalice Of Man’. What a perfect track. This is, undoubtedly, the strongest song in the entire album. There is absolutely nothing wrong with it. It is the prime example of power and force, a real definer of what AOA are about: This heavy/power/speed/thrash mixture that will stick to your mind, glue itself with awesomeness and refuse to leave. There is a Portuguese word which describes it perfectly: ‘portento’. It can be translated as prodigy, something of immense talent. ‘Chalice Of Man’ is exactly that: A once-in-a-lifetime track exuding talent from every pore. Onwards we go to find ‘The Answer’. Another ballad, yes, but, in my opinion, the best in the album. It redefines the expression that so many times was thrown around in the 80’s: power ballad. It is a power ballad indeed, without being cheesy. It is a power ballad in the sense that yes, it is a ballad and yes, it is powerful. But think not of all those cheesy 80’s Whitesnake-ish power ballads everyone is used to and knows: ‘The Answer’ truly, and without the shadow of a doubt, reinvents the expression ‘power ballad’. And Matt Barlow’s voice never sounded better. And now we’re nearing the end of our journey. Two more tracks left, them being: ‘What I Am’ and ‘The One Eyed King’. Ashes Of Ares want us to know who they are, and they have shown us just that throughout their debut album. They declare us to take our judgement, for God knows who they are. Well, if there is more, please bring it on. We want more of this fantastic music. ‘The One Eyed King’ was written by Barlow during his time in Iced Earth. He has spoken about this track: “Everyone tends to follow blindly. Where I came up with the concept is the old proverb that says, ‘In the land of the blind, the one-eyed man is king.’ And if we’re all following around blindly, the man with the one eye will basically lead the pack.” – It leaves to the imagination whether this was written as an outcry for freedom of composition. Well, if it was, or if it wasn’t, it doesn’t really matter. It is what it is: An Ashes Of Ares song, in all its glory. All in all, this album deserves more than one listen. It deserves a repeat button of its own. When I picked it up for reviewing, even though I knew who’s behind this project, I wasn’t expecting to be so into it. You’ll listen to it one time, and you’ll think “Okay, this is pretty good.” – But then you’ll realize it’s getting inside you. Within you. It’ll leave you wanting more, salivating for one more listen of this or that particular track. It becomes an addiction – You’ll need to listen to it. It’ll be in your blood flow pretty soon, trust me.